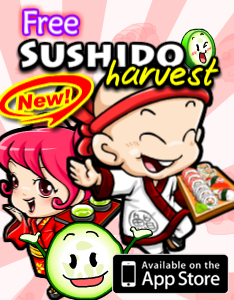 We have released our next iPhone®/iPod touch® game, Sushido Harvest, and its ripe for the picking! Sushido Harvest is a new variation of the ever popular coin drop arcade game. Let your cucumber fall into one of the many trays at the bottom and form 3 cucumbers in a row or better, and stand a chance on harvesting a sushi reward. Be careful not to let 2 coins to fall into the same tray or you will lose them all!